A host of world-class cricketers were at the Manor Ground this afternoon when Worthing hosted the Lashings All Stars. The Lashings team is like a who’s who of international cricketers. West Indian trio Kirk Edwards, Tino Best and Sherwin Campbell, Indian batsman Wasim Jaffer, Pakistan bowler Yasir Arafat and England T20 star Tymal Mills were among those part of their side. After winning the toss, Lashings batted first and posted 221-3 from their 20 overs as Edwards smashed 73 and captain Chris Schofield hit 58 not out. In front of a large crowd at the Manor Ground, Martyn Swift conceded just three runs off the opening over, before Edwards smashed three sixes and two fours off the second over bowled by Adam Squires. Edwards reached his half-century in the seventh over, before Kevin Punter made the breakthrough when Indian batsman Jaffer was caught by Benn Challen for 20. Harry Dunn then bowled dangerman Edwards for 73, which came from just 38 balls with seven fours and four sixes. Brendon Montgomery then took a third wicket for Worthing, bowling Campbell for 23, to leave Lashings 150-3. Lashings then added 70 in the final five overs as England leg-spinner Schofield finished unbeaten on 58 from 34 balls and Darren Maddy struck 25 not out off 12 deliveries. Renowned commentator Henry Blofeld was on commentary for the first innings and was full of praise for Swift’s bowling and fielding display. 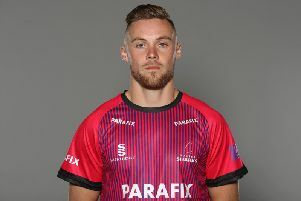 In reply, Worthing opening batsmen Alex Harris and Sam Jones faced the pace of two of the fastest bowlers in county cricket, Mills and Best. Harris admitted afterwards that a longer than usual tea did little to ease the nerves of facing the pacemen. The Worthing openers faced some blistering deliveries but put on 41 for the first wicket. Harris hit fours off Mills and Arafat, before Jones was bowled by Arafat for 17 in the tenth over. Harris then pulled a six off Arafat but was promptly bowled the next ball for 25. Former England spinners John Embury and Schofield accounted for much of the Worthing middle order, before Mills came back on and deceived both Worthing captain John Glover and Josh Wood with slower balls. Worthing were all out for 100 in the 19th over in the end but a great day was had by all, while funds were also raised for St Barnabas House. Lashings manager David Smith afterwards praised Worthing for how the day went and said the Lashings cricket stars would be happy to return to play Worthing again.